If you’re venturing into the porcelain sign world and would like to start collecting, there are a few things you should know before doing so. Porcelain sign reproductions are great if you would like to own a specific sign without having to pay top dollar. In the porcelain sign world Musco, Clipper, and Kelly Tires, just to name a few, are considered the “Holy Grails” of porcelain signs with prices that can range up to $50,000. Not everyone has that kind of money to throw down on one sign, so an alternative would be reproductions. However, if you want to collect the authentic and stay away from the fake porcelain signs, then there are many details you should know before starting your journey. Telling the difference between an authentic porcelain sign and a reproduction takes practice, but it can be done. There are several different ways to tell what’s real and what’s fake. Most reproductions are marked as such and are never meant to deceive. Be that as it may, there are those who may sell them for the high prices they don’t deserve, which is why you must be prepared before advancing into this hobby. Don’t forget to browse our site. We have thousands of authentic signs listed in our image gallery. The placement of the mounting holes is just one of the ways to determine if the sign you’re looking at is real or fake. Some companies only made one sign with one specific design. If that sign has eight mounting holes and the sign you’re handling has six, that’s a red flag for it being a reproduction. In the same scenario, if you see a sign that is a completely different style than what you’re familiar with, most likely it’s a fake. In other words, if the company only produced an Oval sign and you’re inspecting a die-cut, that’s also a red flag. Grommets were also used by many companies and were made from materials that could resist rust and therefore placed inside the mounting holes. This was done to protect the corners of the sign. Many reproductions also have grommets in place. An easy way to tell if the current sign you’re looking at, that has grommets, is real is if rust appears under the grommet and if the grommet itself is in a shape that looks as though it has been used and hung many times. Use your judgment on these, if the grommet looks new and as though it has never been used then that’s a red flag for a reproduction. One factor of determining whether or not the porcelains sign is real is the way the porcelain is laid out or the general quality of the sign. This method involves a thorough inspection of the sign. When these signs were produced, companies enlisted the help of professional porcelain enamel sign makers to construct and paint their soon to be symbols of advertising. The layout of the porcelain enamel shows the difference between a legitimate sign and an imitation. Remember, the original authentic porcelain signs were created by professionals. That being said, the signs were perfect. The lettering was straight with absolutely no wavy appearance; most lettering on a reproduction can be seen as curvy and cartoonish. The layers of porcelain can also show if the sign is a counterfeit. On the original porcelain signs the first layer applied was the white enamel. Any other colors were layered on top of that. 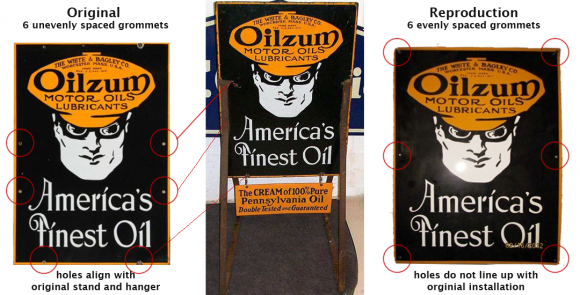 If you come across a sign where the paint is flush, odds are, it could be a fake. Best way to tell is by running your finger across the colors, if you can feel the difference in heights of the colors, most likely, it’s a real sign. Stamps play a big role in determining the status of a porcelain sign is real or just a copy. Many of these stamps provide us with the date the sign was registered or the company that created it. Some reproductions have been known to slightly modify these stamps. For example, where the stamp states REG., some reproductions change it to RED. Also keep in mind that not all signs were stamped by the maker which will force you to determine if the sign is fake another way. Looking closely at these details will help you decide on if a sign is real. Don’t be intimidated, take your time, focus on these points, and they will help you build your collection. Never get too comfortable. Fake porcelain signs are sold everywhere. Yes, you are more likely to find fakes on ebay, craigslist, and flea markets. But those are not the only places we see them. It is not unusual to see an “old-time” collection that is 90% authentic and 10% reproductions. Don’t assume that just because a sign is surrounded by originals that there couldn’t also be a fake in there. Definitely don’t assume that because the asking price is high that the sign most be genuine. 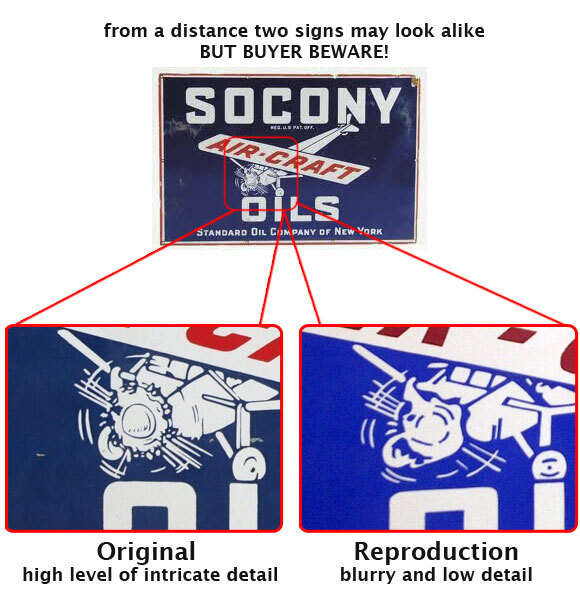 When examining a sign to determine if it is authentic, take out all of the other variables and just look at the sign. If it takes you more than a a minute or two to decide if it is genuine, then it probably isn’t. Don’t ignore the warning signs. Feel free to contact us with any questions or concerns about your porcelain sign. We are always happy to help. We can tell you if your sign is real and what it is worth.